Reported cases of renal cell carcinoma metastatic to the nose or to the tongue are rare. No case of renal cell carcinoma metastatic to both sites has been previously described. In this article, we report what to our knowledge is the first such case. The nasal metastasis grew rapidly and was treated with radiotherapy. Subsequently, a rapidly enlarging tongue metastasis developed, and it was removed via laser excision. Despite treatment, the patient died within 4 months of the diagnosis. Renal cell carcinoma is the third most common neoplasm reported to metastasize to the head and neck region; only breast and lung carcinomas do so more often. (1-3) Renal cell carcinoma is (1) the most common tumor of infraclavicular origin to metastasize to the paranasal sinuses, larynx, and skin of the head and neck region, (2) the second most common neoplasm to metastasize to the jaws and temporal bones, and (3) the third most common tumor to metastasize to the thyroid and parotid glands. (1-3) In contrast, the literature contains only 26 cases of renal cell carcinoma metastatic to the nose and only eight cases metastatic to the tongue. (4,5) In this article, we describe the case of a patient whose renal cell carcinoma metastasized to both the nose and tongue. To our knowledge, this is the first report of such a case. A 45-year-old man came to the Beaumont Hospital in Dublin, Ireland, with a 2-month history of dyspnea, productive cough, lethargy, and night sweats. Chest x-ray detected a diffuse nodular shadowing that was consistent with a pulmonary metastasis. 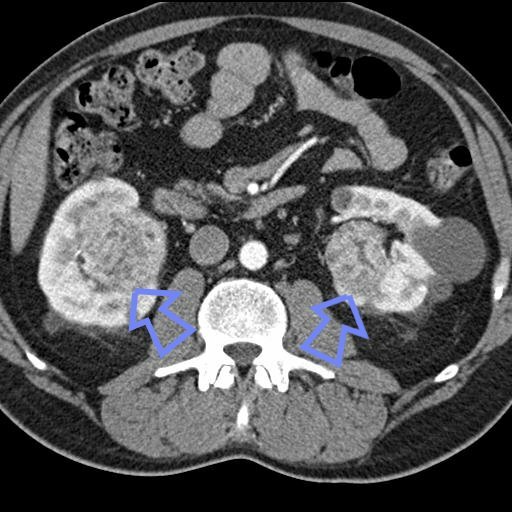 Computed tomography of the abdomen identified a left renal mass, and biopsy confirmed that it was a clear-cell carcinoma. The patient was started on a course of interleukin and interferon therapy. Four weeks later, the patient began to experience epistaxis. Examination of his nose revealed the presence of a large fungating mass that had arisen from the right side of the nasal septum. Biopsy examination identified the mass as a metastatic renal cell carcinoma. The patient was treated with a 2-week course of radiotherapy, but the lesion continued to enlarge. Eight weeks after his initial diagnosis, the patient developed a pedunculated fungating mass at the tip of his tongue (figure). Biopsy confirmed that this lesion was also a metastatic renal cell carcinoma. Histology identified the typical pattern of large polygonal cells with central round or oval, hyperchromatic nuclei and abundant clear cytoplasm. The patient's general condition deteriorated, and the tongue mass enlarged rapidly, impairing his speech and swallowing and threatening his airway. The tongue lesion was successfully removed via laser excision. The patient died of his disease shortly thereafter. Nasal metastases can cause swelling, nasal obstruction, and pain, but epistaxis is the chief symptom (>70% of cases). (8) The previously reported cases of metastasis to the tongue occurred in patients with generalized dissemination, particularly to the lung. (9) Possible routes of metastasis to the tongue include the systemic, venous, and lymphatic circulations. (7) The most common site of lingual metastasis is the basal region of the tongue; this is believed to be a result of either the tongue's rich vascular supply (via the dorsal lingual arteries) or to the relative immobility of this area compared with other areas of the tongue. (9) The metastatic deposits from renal cell carcinoma are vascular in nature, and they often bleed. 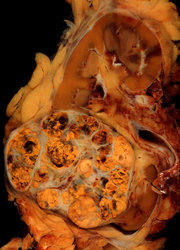 The histopathologic characteristics of metastatic renal cell carcinoma include the presence of encapsulating connective tissue, clear cell borders, round- or oval-shaped nuclei, and abundant clear cytoplasm. (1.) Batsakis JG. Tumors of the Head and Neck: Clinical and Pathological Considerations. 2nd ed. Baltimore: Williams and Wilkins, 1979:240.51. (2.) Bernstein JM, Montgomery WW, Balogh K, Jr. Metastatic tumors to the maxilla, nose, and paranasal sinuses. Laryngoscope 1996;76:621-50. (3.) Nahum AM, Bailey BJ. Malignant tumors metastatic to the paranasal sinuses: Case report and review of the literature. Laryngoscope 1963;73:942-53. (4.) Cheng ET, Greene D, Koch RJ. Metastatic renal cell carcinoma to the nose. Otolaryngol Head Neck Surg 2000;122:464. (5.) Lim RY, Bastug DF, Caldwell BL. Metastatic renal cell carcinoma of the nasal septum. WV Med J 1989;85: 143-5. (6.) Som PM, Norton KI, Shugar JM, et al. Metastatic hypernephroma to the head and neck. AJNR Am J Neuroradiol 1987;8:1103-6. (7.) Boles R, Cemy J. Head and neck metastases from renal carcinomas. Mich Med 1971;70:616-18. (8.) Sgouras ND, Gamatsi IE, Porfyris EA, et al. An unusual presentation of a metastatic hypernephroma to the frontonasal region. Ann Plast Surg 1995;34:653-6. (9.) Okabe Y, Ohoka H, Miwa T, et al. View from beneath: Pathology in focus. Renal cell carcinoma metastasis to the tongue. J Laryngol Otol 1992;106:282-4. (10.) Pantuck AJ, Zisman A, Belldegrun A. Gene and immune therapy for renal cell carcinoma. Int J Urol 2001:8:S1-4. (11.) Hefer T, Joachims HZ, Golz A. Metastatic renal cell carcinoma to the nose. Eur Arch Otorhinolaryngol 1994;251:127-9. From the Department of Otolaryngology--Head and Neck Surgery (Dr. Lang, Dr. Patil, Dr. R. Walsh, and Dr. M. Walsh) and the Department of Pathology (Dr. Leader), Beaumont Hospital, Dublin, Ireland.